In January 2009, we questioned whether KVH and Viasat could afford the investment needed to complete their 2009 coverage expansion plans, as shown below. 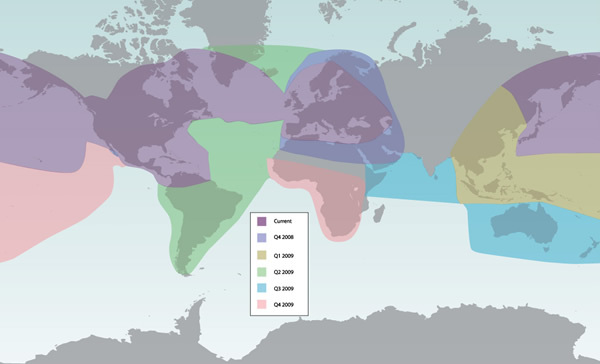 Now the planned coverage expansion shown on KVH’s website has changed, with the South Pacific coverage expected in Q4 2009 dropped (at least for now), and the East Asian expansion delayed. Is the current economic slowdown beginning to impact miniVSAT demand, or is it just that with other parts of KVH’s business suffering, the company is now trying to be more cautious with its investment? Although Inmarsat has not yet seen any impact from the downturn, we should find out in the next few months how widely the current economic pain is going to be felt in the maritime satcom market. Given the high capital cost of maritime VSAT equipment, it wouldn’t be surprising if VSAT suffered more than Inmarsat from any slowdown in maritime communications spending. Is this deja vu all over again for the MSS industry? ICO North America has filed for bankruptcy, and plans to turn over almost all of its equity to the convertible debt holders who would have been due for repayment of $767.6M in August. ICO North America has an S-band GEO satellite in orbit, which it launched in April 2008, and had planned to develop a mobile video service for cars which it referred to as MIM. However, these plans were put on hold while the company renegotiated its debts. There is a distinction between ICO North America, now referring to itself as DBSD, and its parent company, ICO Global, which is not filing for bankruptcy. ICO Global is responsible for a MEO satellite system, whose first satellite was launched back in 2001, although the system was never completed. Though ICO maintains it has a legacy claim to spectrum rights in the S-band on a global basis, the European Commission decided yesterday that it would instead award European spectrum licenses to the Inmarsat and Solaris Mobile. ICO Global’s main asset is the judgment of $631M that it was awarded against Boeing in January this year, after a trial in which ICO blamed Boeing for its inability to complete the MEO system. ICO has not yet collected this judgment, which Boeing has appealed, and ICO has estimated it could take two years for the matter to be resolved. ICO Global was under no obligation to share any of the Boeing judgment with the ICO North America convertible debt holders, but could have presumably cut a different deal if had wanted to keep a bigger share in ICO North America’s assets and give up some of the potential future litigation proceeds. Clearly ICO Global has therefore decided that these potential future litigation proceeds are more valuable than the share of the GEO satellite and spectrum assets that it could have obtained in exchange for them. That may be good news for ICO Global’s shareholders, since there are about 200M shares outstanding, implying the potential future litigation proceeds are equivalent to $3 per share (compared to a current trading price of $0.60) if Boeing’s appeal is unsuccessful. However, it doesn’t help the prospects for ATC if Craig McCaw, one of the savviest spectrum investors around, believes that ICO North America’s satellite and spectrum assets aren’t worth more than the $767M owed to its convertible debt holders. Our view continues to be that the ATC spectrum will eventually be put to use in terrestrial networks, the problem is just that ‘eventually’ might be quite a long time. The European Commission has announced the result of the S-band MSS selection process: as expected the two winners are Solaris Mobile and Inmarsat, with ICO and TerreStar’s applications rejected. In response to the announcement, Inmarsat said it was “delighted to be the recipient” and “will look to pursue the commercial partnerships necessary to ensure that the returns from the required investment in our S-band programme will generate acceptable returns on capital without undue risks or uncertainties”. However, it may not have much time to establish these partnerships, since the EC has stated that “within 30 working days of the publication of the list of selected applicants they shall inform the Commission in case they do not intend to use the radio frequencies”. If applicants decide to move forward (i.e. do not return the license) then they “will be bound by the commitments that they have undertaken, including commitments made concerning consumer and competitive benefits and geographic coverage” and all new systems must have “development and deployment completed” by May 2011 “at the latest”. A two year deadline for deployment is extremely tight, and Inmarsat would have to start spending serious money in the very near future (probably close to $100M in the next 12 months and $300M over the next two years) to complete and launch a satellite in this timeframe. It will be very interesting to see if Inmarsat can find partners to come up with this amount of money (or enter into some alternative form of capacity purchase contracts) in the next 30 days. Given that Solaris already has a satellite in orbit (albeit with more limited coverage) and has not yet announced any meaningful capacity commitments, it would be quite a surprise if Inmarsat was successful, especially in the midst of an economic downturn. It remains unclear what sanctions the EC can impose on operators who fail to live up to their “commitments” and ultimately do not complete an S-band satellite on the promised schedule. We would have thought it unlikely that fines or other monetary penalties would be imposed, but coming a day after Intel was fined more than 1 billion Euros by the EC’s Competition Directorate, this may not be a good time to get on the wrong side of the Commission.